It’s like how I feel when I go kayaking. 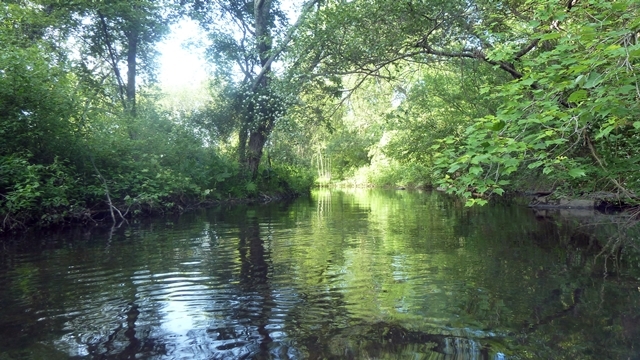 I take in the scenery, enjoy the splashing of the water as I paddle, and drag my hand through the water to cool off. I always have such a sense of well-being when I go kayaking. It’s all wonderful but I realize I am just an observer. What if I became more a part of things? Surrounded by the warm, clear water and subjected to the heat of the sun, the urge to go swimming takes over and I jump in. All those wonderful feelings of peace and contentment are magnified when I immerse myself in the cool water. It takes some effort to enter the water. Maybe it will be cold. Painfully cold. I won’t know what the bottom will feel like. Will it be squishy with plants and mud? Will there be rocks to hurt my feet? Maybe a fish will bite my toes! I can’t see all the way to the bottom so I have to go on faith. Is it worth the effort? I think so. It’s always worth it in the end. Deciding to go below the surface in our lives is a risk too. We have no idea what we will find. We have to trust in Something beyond ourselves leading us into the unknown. For St. Augustine, going beneath the surface of his life turned out to be a life-changing experience. He finally heard the invitation. And it was so compelling that he took the risk and dove in. We can gather from the words of his prayer that it was well worth the risk. It was the first of many dives into a wonderful unknown for this saint. Perhaps this is the invitation you are hearing this Lent, to stop being a bystander and become part of the action. We can sit in our boats and ride on the surface or we can take a chance on jumping into the water. St. Augustine makes it sound quite inviting to me. How about you?